Glitch art mythologizes the computer error as its ultimate muse and most potent tool: the event that triggers each piece to manifest. The glitch aesthetic may be rooted in the look of malfunction, but when it comes to actual practice, there’s often not much glitch in glitch art. 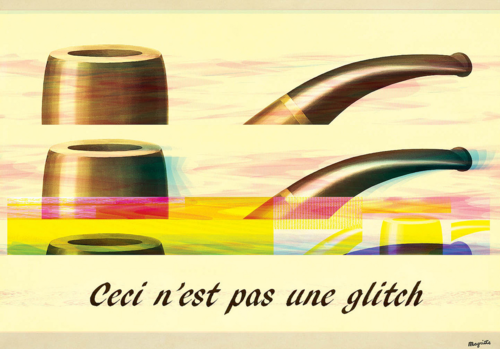 Temkin argues that rather than the results of glitchy, error-filled machines, much of “glitch art” is the result of functioning machine processes, spitting out the logical results of the information and instructions given. These instructions, however, are often “algorithms stripped of their ordinary purpose or built with no clear purpose at all”. Temkin describes this process with this gorgeous and evocative turn of phrase: “exploring the wilderness inside the machine.” This framing of glitch art practices is really exciting to me because it brings in a sense of agency, intentionality, and collaborative exploration that sometimes feels lacking. Thinking of glitch art as a series of “accidents” can, at least for me, make the work difficult to engage with beyond a technophilic desire to see how digital objects look on the “inside”, or a sort of punk rock satisfaction in watching people break things. But as cool as the happenstance generations of a broken machine can be, glitch art is more than that. In Temkin’s definition, glitch art isn’t really glitch art but algorithmic art, the collaboration of human irrationality and curiosity with the logical but unpredictable results of technological systems, and the exploratory manipulation and curation of those results as artistic expression.